Here’s part 2 of the three part series on bike touring from Terra Ash…. Like most outdoor endeavors, bicycle touring can be a very expensive activity or a relatively inexpensive one. One rule that will help you save money in the long run is to invest in high quality equipment from the beginning to prevent unnecessary replacements. Touring is hard on equipment, so it’s best to pay a little more for a higher quality product. What to look for in a Touring Bike? Above all else, make sure your bike fits you. You might be able to ride a bike that is slightly too large or small on your weekly rides but when you’re riding upwards of 50 miles (80 km) for several days straight, an ill-fitting bike will cause major discomfort and could cause injure. Visit a bike shop and get professionally fitted to prevent this from happening. I have seen all types of bikes used for touring, from a Wal-Mart mountain bike to a custom built carbon frame. It is true that you will be more comfortable and probably experience fewer issues with a bike built specifically for touring. The sky is the limit when it comes to price, but a touring bike well usually start out around US$800 for a lower quality frame. Several bike manufacturers make touring bikes, but some of the more well-known frames come from Raleigh, Surly, Salsa and Moots. Most cyclists tour on a steel or titanium frame. These materials are sturdier and can hold up to the pressure of changing or rough terrain, unruly weather and carrying heavy bags. 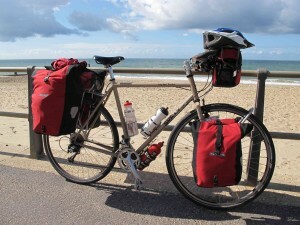 A touring bike should come with racks on the rear and/or front wheel, or at a minimum mounts for racks. Fenders are very necessary addition for touring if you want to keep your back and bottom clear from water and mud spray, so make sure there is ample tyre clearance. Drop handlebars provide more positions for your hands. Flat bars can be used for touring but the position can get tiring after several hours. A few other things to look for would be a high spoke count, high handlebars for comfort, low gearing (20-25 inches/50-63.5 cm) for long climbs and longer chainstays for greater heel clearance. There are more accessories bicycle tourists use every year, but there are a few classic accessories every bicycle tourist should have. Front and/or rear panniers for your racks are a must have. This is where you will keep everything you’re carrying on your bike. Your panniers are protecting most of your equipment, so make sure they are waterproof and high quality. Rain covers or plastic bags will keep your equipment even dryer. You can also carry a bag on your handlebars or under your seat, which is convenient for items you’ll be pulling out frequently during the ride. Do not use a racing seat for touring long distances. We’re going for lasting comfort here, not overall speed. I prefer Terry saddles, which are made specifically for women. You’ll want at least two water bottle cages and water bottles, reflectors or reflective gear and LED headlights and taillights with good battery life. Other things that are nice to have are a mirror, headlamp, bell and bungie cords for strapping loose items down to your rack. You will probably also have to invest in some specialty clothes for your tour. Comfortable, high quality bicycle shorts are a must have because they help prevent chafing. Make sure to slather your chamois with chamois cream to prevent the seams in your shorts from rubbing your skin and causing an uncomfortable situation. I prefer Terry shorts because the waistbands are soft, which prevents discomfort around my stomach when I’m crunched up all day. Cycling jerseys or synthetic athletic shirts are preferable to cotton t-shirts because they wick away the sweat from your body. A waterproof jacket is also a great investment for keeping you dry and as comfortable as possible. Synthetic or wool socks might not seem important, but if you want to prevent blisters they are really a must-have. A good pair of clipless cycling shoes will help improve your comfort and efficiency for a long bike-ride. I used toe-clips for my first tour, but flipping the pedals over was honestly more hassle than it was worth and it is actually easier to unclip cycling shoes than to pull your tennis shoe out of a toe clip. A pair of padded cycling gloves is also a necessity since you’ll be keeping your hands on the handlebars for several hours in potentially uneven conditions. Look for quality padding over thickness, and make sure the gloves breathe or you could end up with uncomfortable blisters on your hands. There are obviously many other areas to think about with bicycle touring equipment. If you’re camping you will need specialty camping gear and you might want to pick up some extra tools since you will be traveling long distances. I would suggest visiting Bicycle Touring’s How-To Articles for more information about the best equipment for your specific tour. Terra Ash Bruxvoort is a twenty-something Des Moines, Iowa, USA, based cyclist and writer. She was the last person in her second grade class to learn how to ride a bike, and didn’t fall in love with the sport until her sophomore year of college. She started out riding trails, became a bike commuter, started touring and eventually raced time trials. She’s been riding almost daily (even through the freezing Iowa winters!) for five years. You can read her musings on nature, raw foods and minimalism at Modern Girl Walden (moderngirlwalden.wordpress.com) and her observations on bike commuting on Twitter @bikecommprobs.